Trusted tonewood combination and subtle aesthetic appointments that'll make it a favorite for years to come. 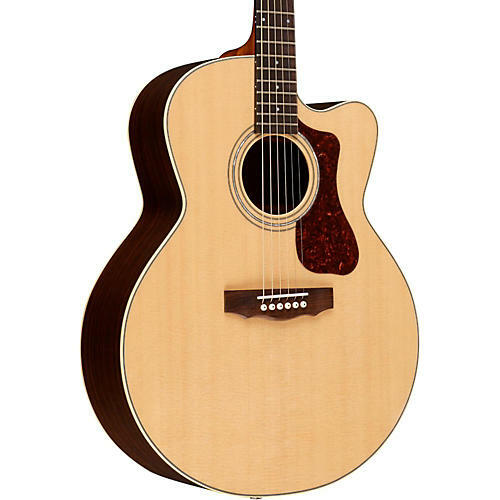 With their large, rounded bodies, Guild' jumbo acoustic guitars have been prized for their volume, projection, and balance ever since the F-50 model debuted in 1954. The F-150CE upholds this tradition with its solid Sitka spruce top, solid Indian rosewood back and sides, elegant cutaway, and powerful Fishman Sonitone pickup. Additional features include an Indian rosewood fingerboard and bridge, NuBone nut and saddle, and mother-of-pearl rosette. This model also has a 1¾ nut width on a vintage shaped Guild neck, iconic Chesterfield headstock emblem reminiscent of 1960s Guilds, period-correct tortoiseshell pickguard, and Guild' new lightweight polyfoam case. Available in Natural gloss finish. Call or click to order this Guild today!